How do you use cacao nibs from Haiti? We have ideas. How do you use cacao nibs? 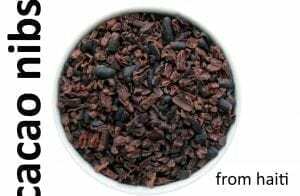 What are cacao nibs you ask? They’re chunky bits of roasted cocoa — smaller than chocolate chips and not as uniform (but tastier and oh, so much healthier!). Cacao nibs have a chocolatey taste, but they’re not as sweet as chocolate, which make them more versatile. Nibs are actually pre-cursors to chocolate. Chocolate makers use super grinders to create a fine mixture out of nibs to serves as the base for chocolate bars. Sugar, cacao butter, and other flavors are slowly added into the grinding process. Bake with roasted cacao nibs as you would chocolate chips. Grind and use as cocoa powder for drinks, baking, smoothies. Add to yogurt for a nutty crunch surprise. Sprinkle over pancakes. Use in muffins. Create your own trail mix & include the nibs! If you’re feeling particularly adventurous, make your own yogurt & add nibs as the crunchy surprise. If you’re a chocolate maker and want to use Singing Rooster’s roasted cacao nibs to craft your own Haitian chocolate, we do that! 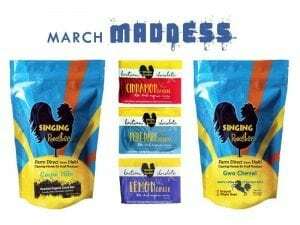 Buy a bag of Singing Rooster’s Haitian cacao nibs online today. While an apple a day keeps the doctor a way, an ounce of dark cacao nibs can keep your blood pressure at bay. There’s no dietary fiber when you eat a chocolate bar, but 1 ounce of nibs = 9 grams of fiber! Feeling cloudy? Cacao nibs relax and widen blood vessels, allowing oxygen and nutrient-rich blood to fuel cognitive function. Dark chocolate is good for skin; rich in antioxidants, dark cacao guards against ultraviolet radiation. Cacao beans are one of the best dietary sources of magnesium — a mineral needed for more than 300 biochemical reactions. Plus – an ounce of nibs has 6% of recommended daily iron. If you’re looking to buy products from Haiti online – we do that. We’re Singing Rooster and open market doors on behalf of small producer farmers in Haiti. Farmers don’t want your checks, they want to sell crops. Putting food on the table is every parent’s goal.